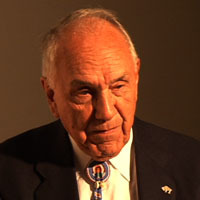 Earl Barlow, retired Director of Indian Education for BIA, has served education in Montana in a number of capacities. Early in his career, he taught school on the Flathead Indian Reservation, then went to work at the state level in Helena. One of his most significant accomplishments was the role he played in the 1972 Montana Constitutional Convention, bringing Indian Education into the public spotlight. During the Carter Administration, Dr. Barlow served as Director of Indian Education in the Bureau of Indian Affairs. In 1979, President Carter appointed him as a charter member of the Federal Senior Executive Service. Putting Indian Voices into the 1972 Constitutional Convention - Earl Barlow. Putting Words into Action - Earl Barlow. A Personal Journey: To Make a Difference in Indian Education - Earl Barlow. Learning of the Constitutional Convention - Earl Barlow. Addressing the Convention - Earl Barlow.